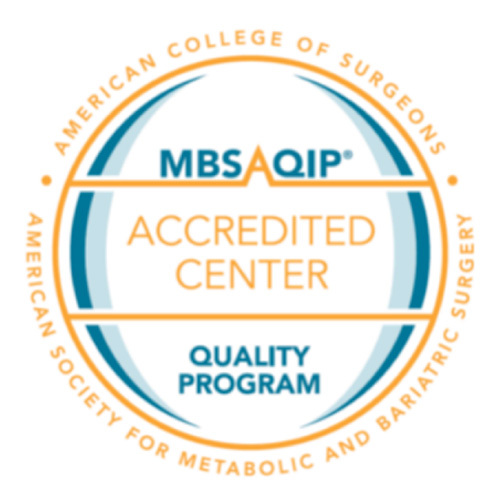 Led by acclaimed weight loss surgeon Dr. Karl Strom, The Center for Advanced Bariatric Surgery is accredited by the MBSAQIP (Metabolic and Bariatric Surgery Accreditation and Quality Improvement Program) as a Comprehensive Center for Bariatric Surgery. A Bariatric Surgical Center achieves Accreditation following a rigorous review process during which it proves that it can maintain certain physical resources, human resources, and standards of practice where patients begin their journeys to happier, healthier lives. Highly experienced in successful weight loss strategies and surgery, we offer a range of less-invasive laparoscopic procedures including the gastric sleeve, gastric band and gastric bypass: As an accredited center we strive to provide safe, high quality care to our patients. Are you having difficulty with physical activity because of your weight? Has your weight led to other health issues? Is your BMI above 35? Ask your primary care doctor about referring you to our center or consider attending one of our monthly seminars presented by our Medical Director, Dr. Karl Strom, to learn more. We will work with you to evaluate whether surgery is an appropriate option and help you determine if your insurance will cover it. All seminars will be held at at Mountainside Medical Center. From nutrition counseling and group support to individual therapy and the latest advances in bariatric weight loss surgery, we offer a world-class program in a convenient community setting. We offer access to a panel of dedicated and experienced specialists. Our team includes cardiologists, gastroenterologists, pulmonologists, endocrinologists, surgeons, nurses, dietitians and behavioral health experts, all working together to develop a personalized care plan for you. This care plan includes extensive education and evaluation before surgery, as well as the lifetime follow-up care and support crucial to keeping weight off and staying healthy. The sleeve gastrectomy is an operation in which the left side of the stomach is surgically removed, leaving it roughly the size and shape of a banana. The nerves to the stomach and the outlet valve remain intact to preserve the functions of the stomach while drastically reducing its volume. 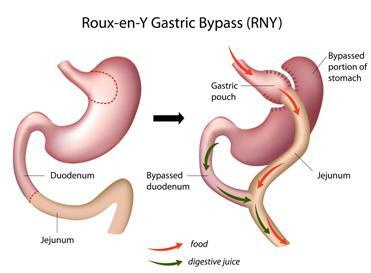 By comparison, when a gastric bypass (Roux-en-Y) procedure is performed, the stomach is divided rather than removed and it can be reconnected (reversed) if necessary. 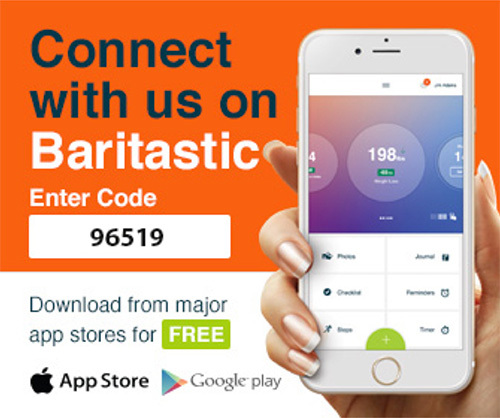 There is no intestinal bypass with sleeve gastrectomy procedures, only stomach reduction. This is the only surgery that substantially removes the "hunger hormone," ghrelin. No adjustments or fills are needed. The chances of an ulcer occurring are minimized. This procedure involves stomach stapling. Therefore, leaks and other complications related to stapling may occur. Because the stomach is removed, it is not reversible. It can be converted to almost any other weight loss procedure. The smaller, remaining portion of the stomach may stretch. Foods that you eat now may cause discomfort, nausea or vomiting after your surgery. Gastric surgery puts you at higher than normal risk of developing gallstones and gallbladder disease. The Laparoscopic Adjustable Gastric Banding procedure controls the amount of food that you can eat at one time. A hollow silicone band, placed around the top of your stomach, creates a small pouch and narrow passageway into the rest of the stomach, thereby limiting the amount of food you can consume. The band is then inflated with a saline solution. After food enters the pouch, it slowly empties into the rest of the stomach. Liquids pass through the narrow opening created by the band while denser foods are delayed from passing through. Band adjustments occur six to eight weeks after surgery and as needed thereafter. For example, the band can be adjusted during pregnancy to allow for appropriate nutritional intake. Patients considering this procedure are carefully screened for dietary habits and preferences as well as pre-existing gastroesophageal reflux disease. 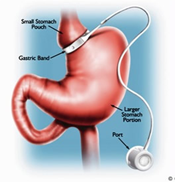 Gastric banding is the least invasive surgical option available and does not involve intestinal re-routing, cutting or stapling of the stomach wall or bowel. After LAP-BAND® Adjustible Gastric Band or other gastric banding procedures, patients can expect gradual weight loss for up to two years. This procedure is associated with reduced patient pain, length of hospital stay and recovery period. Adjustments may be performed without additional surgery, including during pregnancy. This is a fully reversible procedure. Band slippage or leakage may occur and can require an operation to correct the problem. Weight reduction after stomach banding surgery is typically slower than that following gastric bypass. Because a foreign body is implanted in the body, there is a risk of infection at the port-site. 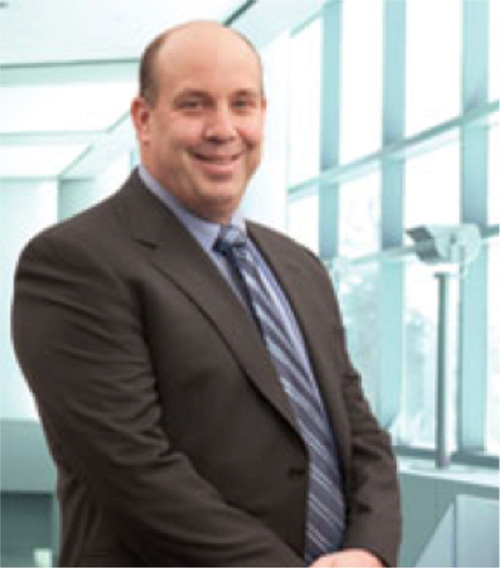 In recent years, better clinical understanding of procedures combining restrictive and malabsorptive approaches has increased the choices of effective weight loss surgery for thousands of patients. By adding a technique called malabsorption, food is delayed in mixing with bile and pancreatic juices that aid in the absorption of nutrients. The result is an early sense of fullness, combined with a sense of satisfaction that reduces the desire to eat. According to the American Society for Bariatric Surgery and the National Institutes of Health, Roux-en-Y gastric bypass is the current gold standard procedure for weight loss surgery. It is one of the most frequently performed weight loss procedures in the United States. In this procedure, stapling creates a small (15 to 20 cc) stomach pouch. The remainder of the stomach is not removed, but is completely stapled shut and divided from the stomach pouch. The outlet from this newly formed pouch empties directly into the lower portion of the jejunum, thus bypassing calorie absorption. This is done by dividing the small intestine just beyond the duodenum for the purpose of bringing it up and constructing a connection with the newly formed stomach pouch. The other end is connected into the side of the Roux limb of the intestine creating the "Y" shape that gives the technique its name. The length of either segment of the intestine can be increased to produce lower or higher levels of malabsorption. In some cases, the effectiveness of the procedure may be reduced if the stomach pouch is stretched and/or if it is initially left larger than 15-30 cc. These procedures are known as laparoscopic. When a laparoscopic operation is performed, a tiny video camera and surgical instruments are inserted through small incisions made in the abdominal wall and the surgeon views the procedure on a separate high definition video monitor. This provides the laparoscopic surgeon with better visualization and access to key anatomical structures while also eliminating the need for one long abdominal incision. Studies have proven that patients who have laparoscopic weight loss surgery experience less pain after surgery, as well as easier breathing, improved lung function and higher oxygen levels. Other benefits of laparoscopy include fewer wound complications such as infection or hernia and a quicker return to pre-surgery activity levels. Laparoscopic procedures for weight loss employ the same principles as their "open" surgery counterparts and produce similar excess weight loss. However, not all patients are candidates for this approach and all bariatric surgeons are not trained in the advanced techniques required to perform this less invasive method. The American Society for Bariatric Surgery recommends that laparoscopic weight loss surgery should only be performed by surgeons who are experienced in both laparoscopic and open bariatric procedures. Weight loss surgery is major surgery. Although most patients enjoy an improvement in obesity-related health conditions (such as mobility, self-image and self-esteem) after the successful results of weight loss surgery, these results should not be the overriding motivation for having the procedure. The goal is to live better, healthier and longer. This surgery is only a tool. Your ultimate success depends on strict adherence to the recommended dietary, exercise and lifestyle changes. It is important to remember that there are no ironclad guarantees in any kind of medicine or surgery. There can be unexpected outcomes in even the simplest procedures. What can be said, however, is that weight loss surgery will only succeed when the patient makes a lifelong commitment? Some of the challenges facing a person after weight loss surgery can be unexpected. Lifestyle changes can strain relationships within families and between married couples. To help patients achieve their goals and deal with the changes surgery and weight loss can bring, most bariatric surgeons offer follow-up care that includes support groups, dieticians and other forms of continuing education. What's your history with diet and exercise? When I was young, I was a competitive figure skater and never thought in a million years that I would end up overweight. But once I stopped training, the weight slowly crept on. I didn't just wake up one day and weigh 300 pounds; it was 20 years in the making, ten pounds a year. When did you realize you had to make a change? I was tired of being tired. It was getting harder and harder to do my job. To live my life. I wanted to set a good example for my daughter. And deep down I knew that 300-pound woman wasn't me. Why did you feel like surgery was the only option? I knew I had the potential to lose the weight and get healthy, but I needed help to control my eating and make better choices. I knew that if I was going to do something as drastic and life altering as the surgery, I had to be really committed. What did you learn at Dr. Strom's introductory seminar that surprised you? Before that seminar I had no idea how nutritionally deprived I was. I ate too much, but there was no nutrition, and I felt terrible. I just thought that was how I felt. I didn't understand that it was a physiological reaction to the foods I ate. Once you decided to have the procedure, what was the process like? It was absolutely amazing. I feel like I have a support system there, I can call whenever I want, I can call the nutritionist with questions about diet and vitamins. They are VERY accessible. And I like the group meetings, too. I go whenever I can. How is life different today? Now I'm a new and improved Deana. My friends love the change because I'm more fun to be around. I have tons of energy. I exercise all the time. My husband and I run together. My competitive spirit is back—I live for race day, crossing the finish line, and getting my finisher medal. What would you tell a friend considering this surgery? I tell them I wish I'd done it fifteen years sooner. It's life changing. And my life is so much better now. After I had my first child and started taking birth control, I started to gain weight. So I joined Weight Watchers. But I'd lose the weight, then I'd gain it right back. Lose it, then gain it back again. And it was very hard to stay motivated. Were you experiencing other health issues? Yes, I had high cholesterol, swollen ankles, aches and pains in my legs and back. What was the process leading up to surgery like? I saw a nutritionist for six months before the surgery, so I learned a lot of behaviors I didn't know before. Portion control, exercise, that it's better not to eat and drink at the same time. How was your experience at Mountainside? They are a great team. I can call anytime with any concerns. I had some gallbladder issues that slowed my recovery, and they very attentive to my concerns. They are the best team ever for this kind of surgery. What would you say to a friend considering this surgery? I would tell them to do their research first and be serious about it. It's not just about looking pretty, you need to be doing it for health reasons. And you have to be ready and willing to change your behavior. How has your diet changed since the procedure? It's very easy to control my portions now. I have a small stomach. I eat off a smaller plate. I eat protein first, then vegetables, then starches, which helps me a lot. Going shopping is interesting. I've forgotten and gone to the plus size section to shop, because I'm not used to my smaller body yet. I have clothes from when I was 17 and they're too big! And your life overall? How are you doing? Once I got the surgery, I was already doing a lot better. Now I feel a lot lighter. And I can run now—I couldn't do that before. I feel great, and I don't worry that I'm going to have diabetes or high blood pressure. This is a great option for health. I was always a big guy, but I was in good shape, and I carried my weight well. But in the ten years post-college I gained 40 pounds, and then I got married. I weighed 240 when I got married. Then the kids came along—that's when I really started to put it on. I was 347 pounds when I decided to have the sleeve procedure. How was your weight affecting your quality of life and your health? When you get that heavy, doing anything—walking, going up a flight of stairs—is really difficult. My hip started bothering me, then my knee. Then my cholesterol increased and my blood sugar got up to 149 (150 is Type 2 Diabetes). My blood pressure was 140/90. I had sleep apnea, which makes you extremely tired. What prompted you to consider weight loss surgery? A year and a half ago, I went for my checkup and the doctor said everything looked fine. But then a week later, the nurse called and said the doctor wanted to see me back in his office. I thought, "this is it—the call I've been dreading." He said he was calling me back in as a friend and told me about Dr. Strom's seminar. That was the wakeup call I needed. What made you realize surgery was the right choice for you? I had tried different diets many, many times over the years. 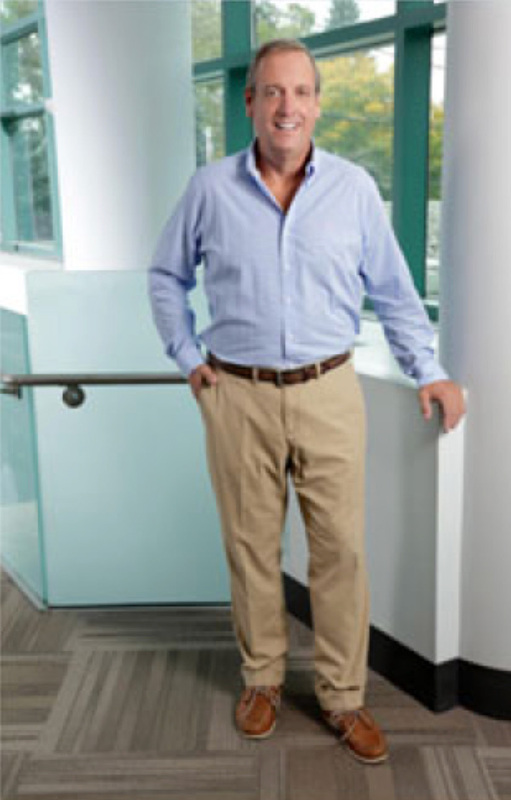 I thought it was simply poor choices or a lack of willpower on my part, but Dr. Strom really helped me see that when you're obese, there are many factors working against you that are largely outside of your control. How long did it take you to recover from surgery? It was quick. I had no complications. I went in at 7:30 a.m., and I was in recovery by 8:45. Home within two days, and within a week I was riding my bike. And now that over a year has passed? I have been back to my college weight for the past eight months. My blood pressure, my cholesterol, my blood sugar, my vitamin levels—all great. Sleep apnea—gone. I'm not sweating all the time. I have energy. I can be active. It's the best thing I could have done for my health.